It is a vote an account budget that allows the industry to see through the sustainability and stability of the major policy initiatives of the government going into the year 2019 and beyond. Second, there are significant challenges and opportunities on the road ahead moving forward towards realizing the full potential of gross value addition in the domestic economy. A report published jointly by The News Line and NASSCOM projects the gross value addition (GVA) at US$ 1.8 trillion, of which new digital ecosystems may contribute 45-50% at US$ 905 billion, digital payments and ecommerce are likely to contribute US$ 15 billion, electronics manufacturing is likely to contribute US $ 420 billion, telecom and media are likely to account for another US $120 billion and the IT/BPM vertical is likely to account for another US $360 billion in digital revenues by the year 2025. While this scenario augurs well for the digital strategy consulting companies and the information technology services industry vertical overall, there are issues to be addressed and not all of them may be resolved through budgeting alone. India has only 150000 engineers who skilled in building AI technologies.India has a severe shortage of engineers in these technologies, especially when countries like the US have a talent pool of 850,000 AI engineers. The budgetary allocation of Rs 3,073 crore (US$ 483.09 million) for the Digital India programme made for 2018-19 is a pointer in the right direction for the digital services industry. Corporate enterprises and start-up firms can look forward to optimistic signals on the growth of the digital services vertical. The Union budget 2017-18 has allocated Rs10,000crore towards Bharat Net to expedite the project of connecting rural areas with high speed internet. This is expected to augment market development for digital services in the rural areas, enable digital entrepreneurship and open new avenues for multilingual user interface and user experience design for rural markets. The budget has allocated Rs 2,500 crore benefits for UPI based payments and other digital payments, thus giving a boost to financial technology services. It is an indicator of the growth of the segment of financial technologies in India with a steady growth in demand for services of mobile banking, social media banking and mobile app store optimization services based on aggressive content distribution strategies, web development and mobile development services for the BFSI vertical. Bharat Net project is being implemented by the Department of Telecommunications (DoT) to create network infrastructure for providing100 Mbps broadband to all gram panchayats (approximately 250,000) in the country in a phased manner by the end of 2018. 250,000 villages have got optical fibre connectivity under Bharat Net program. The government will work towards connecting another 150,000 villages under Bharat Net initiative in the coming financial year. It will now scale it up by providing 500,000 Wi-Fi hotspots in rural areas to provide easy internet access to 50 million Indians. # DigiGaon initiative shall be launched to provide tele-medicine, education, and skills, through digital technology. These above mentioned measures of digital infrastructure creation in the rural economy aim to open avenues of economic growth by bringing an additional 50 million Indians under the net of the digital economy, while stimulating the demand for customized content marketing, mobile apps development and UI & UX design services in the verticals of information, communication and entertainment (ICE), education, e-governance, tourism and health care. There will also be anAadharPay, which will be useful for people that do not have debit and credit cards, and net banking facility. There will be 10 lakh point-of-sale (POS) machines in the country and 20 lakh Aadhar-based POS by the end of the financial year 2018-19. Service charges have been withdrawn on railway ticket reservations through IRCTC and e-tickets.Cashless reservations in railways have gone up from 58% to 68% in the on-going financial year. The government is set to launch two new schemes to promote use of BHIM – referral bonus scheme for individuals, and cashback scheme for merchants. SIDBI will refinance merchants and businesses based on transaction history. A mission will be set up with a target of 2500 crores digital transactions for FY 2017-18 through UPI, USSD, Aadhar Pay, IMPS, and debit cards. The road map in the union budget towards leveraging digital technology services has several implications on different verticals and thus by implicit logic on the demand for specific digital marketing services. First, the assigning of unique IDs to corporate enterprises shall enable on-boarding of businesses into digital platforms for business, compliance and regulatory objectives. This shall pave the way for enterprises that operate in brick and mortar format to move up the digitization platform to become click and mortar (CAM) enterprises, effectively stimulating demand for search engine optimized websites, social media optimization and mobile applications development. Second, the launch of AadharPay promises to bring consumers at the bottom of the pyramid into the digital economy increasing demand for design and development of secure payment gateway integrated SEO enabled business websites in verticals like online retail, food & beverages, quick service restaurants (QSRs), ICE, BFSI, healthcare, passenger transport, commercial freight and pharmacy. Third, the participation of SIDBI in ensuring cash back schemes for merchants shall incentivise online business development and sales by reducing shoe leather costs of dealing in cash, thereby allowing digital consulting companies to offer inputs into creating and maintaining digital portfolios of business like websites, apps and social media properties. Second, the setting up of a payment regulatory board in the Reserve Bank of India to regulate electronic payments replacing the currently existing Board for Regulation and Supervision in Payments and Settlements System. The Department of Telecom shall support the establishment of an indigenous 5G Test Bed at IIT, Chennai. 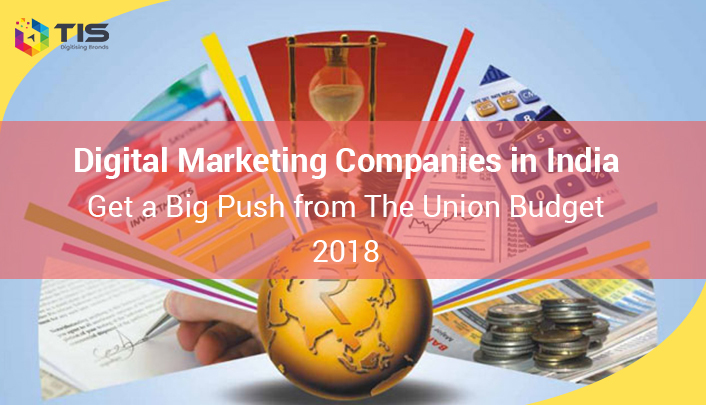 TIS, the leading digital marketing service company in India looks forward to the union budget as favouring business growth of the industry, market development in the domestic economy for digital services like website development and design, hybrid and native mobile applications development, user interface and user experience (UI &UX) and custom product development (SaaS) services. We welcome the initiatives to develop the potential of the domestic market of India while taking the movement of digital transformation of brands to rural areas in a big way.